Relax by the pool, sip a cocktail on the beach, explore the marine environment in a submarine . . . 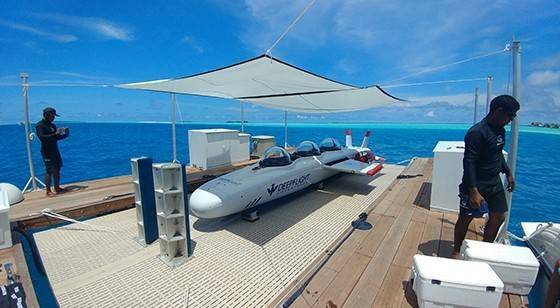 Guests at the Four Seasons Resort Maldives at Landaa Giraavaru are able to go beyond the typical vacation experience with an underwater flight excursion aboard the three-person DeepFlight Super Falcon 3S, a submarine designed specifically for underwater tourism. For $1,500.00 (+12% GST) per flight, a trained submarine pilot will take up to two guests below the surface to explore the beautiful Maldivian waters in DeepFlight Adventures’ newest 8-meter sub. Over the course of an hourlong dive, passengers can expect to skim over coral formations; fly through shoals of the 1,000 species of brightly colored fish that inhabit the BAA Atoll; and maybe even encounter creatures like turtles, sharks, dolphins and rays. The battery-operated Super Falcon 3S features a brushless DC drivetrain and underwater lithium-iron-phosphate battery pack. It can dive to depths of 37 meters and features minimized electric and acoustic emissions so as not to disturb the marine life. Its flight-inspired design allows the Super Falcon 3S to glide effortlessly over reefs and cruise alongside marine life. It’ll never land on the seabed or reefs. While underway, a surface team constantly tracks and monitors the sub. In the unlikely event of power loss, fixed positive buoyancy combines with a thrust and lift system to enable the Super Flacon 3S to automatically float back to the surface. DeepFlight Adventures said it is expanding to additional locations around the world through a cooperation with HadalX, based in Shanghai.